Is It Time To Ditch Facebook, When There’s Half a Million Fans Across Russell Group Universities? The changes to Facebook announced at Facebook’s F8 Developers conference last week haven’t gone down well in some circles with a number of the people I follow on Twitter expressing their concerns at the privacy implications of recent changes and one or two having gone as far as to delete their Facebook accounts. Might those technically-savvy people be setting a trend which will become more widespread as the privacy concerns become more widely known beyond those who read blog posts which describe in detail how Facebook can monitor your interactions, even when you are logged out of the service? Or are these people in a minority and will we see that once the changes have been fully deployed and problems fixed in light of user feedback could be see an increase in Facebook usage? In order to be able to gather evidence of possible changes in usage patterns within the UK HE sector I have updated a survey of Use of Facebook by Russell Group Universities which was carried out in January 2011. A summary of the numbers of people who have ‘liked’ the pages, together with details of the changes from the previous survey are given in the following table. In brief in a period of nine months we have seen an increase in the number of ‘likes’ for the twenty UK Russell Group Universities of over 274,000 users or almost 100% with the largest increase, of over 155,000 occurring at the University of Oxford. The previous survey highlighted emerging patterns of institutional use of Facebook and provided some suggestions on best practices (such as providing a Facebook page rather than a group and having a short and branded URL). It seems that institutions are implementing such best practices more widely. We are also seeing a huge increase in the number of Facebook ‘likes’ with apart from Nottingham’s 7% increase, all of the other institutions seeing a growth of between 33% and 345%. But might this represent a peak for institutional use of Facebook? Since we have over half a million users, many of whom will be staff or students at Russell Group Universities we might expect this particular demographic to have a better understanding of the dangers of misuse of Facebook than the general public. It will be interesting to see how these figures change over the next academic year. Beyond the Evidence of Usage – Is Facebook a Walled Garden? This post has focussed on institutional use of Facebook to provide services to end users (a business-to-consumer relationship). Of course there are privacy implications associated with use of Facebook and it might be argued that Universities shouldn’t be using unethical network providers – just as there were pressures on universities not to support businesses which had links with South Africa during the apartheid era. This morning I was involved in a brief Twitter discussion in which Twitter was dismissed as a ‘walled garden’. It was suggested that, just like AOL, you need to sign up to access content hosted on Facebook. Surely not? 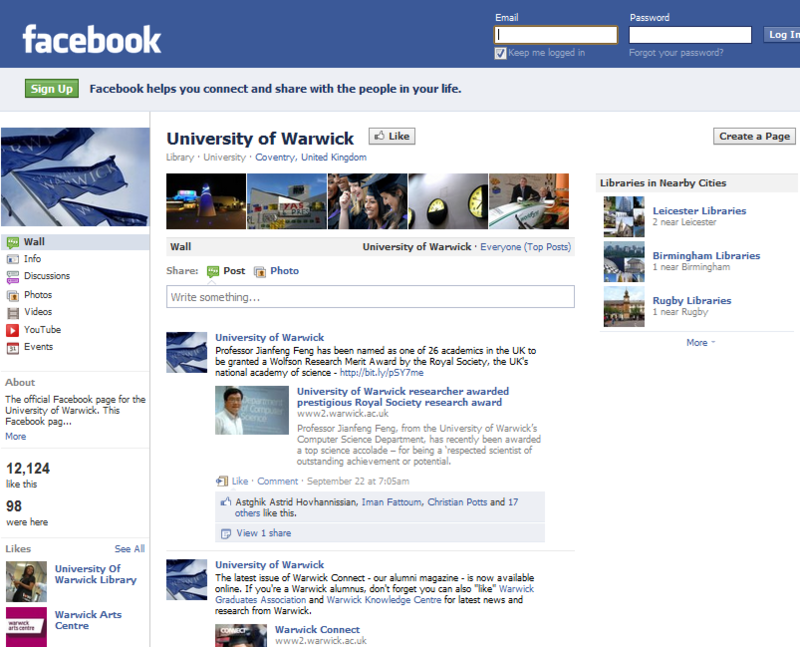 So I logged out of Facebook and visited the University of Warwick page and, as can be seen, I can view the page. But rather than restrictions on accessing public information, perhaps Facebook is described as a walled garden because you can put information in, but not get it out again? Or perhaps the concern is that use of Facebook apps locks information into a particular application? I feel there may be an element of truth to this concern – you can develop Facebook apps which do trap the data into the app. But the Russell Group University Facebook pages seem to be using the default Facebook features, so this isn’t really a current concern. And even apps such as the Guardian Facebook app shouldn’t be regarded as acting as a walled garden since the same data can be accessed in several other ways, such as via RSS feeds, Android and iPhone apps and on the Web itself. I, therefore, am unconvinced that current institutional use of Facebook can be regarded as using a Walled Garden and that Universities are promoting a propriety service. Of much greater relevance will be how people react to the recent changes in Facebook. If people start to leave, there will be a need to reconsider Universities’ uses of Facebook as a marketing and engagement service. This entry was posted on 26 Sep 2011 at 10:00 am	and is filed under Evidence, Facebook. You can follow any responses to this entry through the RSS 2.0 feed. You can leave a response, or trackback from your own site. Facebook is a useful way to manage messages, chat and run events. It is certainly a walled garden — a web within the web — but it’s useful. Really useful. Can we aford not to be pragmatic because we don’t like their (free) service? There’s no strong corporate arguments against using facebook for things facebook is good at — chatting, showing funny pictures and inviting people to parties. Not to do so (brace yourself) is cutting of your nose to spite your facebook. We’re in agreement that Facebook can provide benefits in certain areas (the focus of my post was in institutional marketing). Note that Matthew Rowe also wrote a Facebook export tool. I guess the situation is similar to Twitter, for which there are also 3rd party services which can be used to export structured content. I wouldn’t necessarily believe that means they won’t pull the plug on it anytime soon Brian. Sometimes FB folk say things and then it’s quite some time before anything actually happens. Two examples: iPad app launching (supposedly been ready since the Spring, but only just likely to launch in Autumn) and FBML (was rumored to be pulled well over a year before they finally actually pulled it). Hi Brian, just a really quick and simple point, but the FB page you’ve listed for the Uni of Nottingham is not the one that they use ‘officially’. The one linked from the home page of their website is here: https://www.facebook.com/TheUniofNottingham (and it has 9,992 fans at the point of writing). Thanks Tracy, I’ve updated the table. My pleasure. I thought that number looked a little on the low side. Your post itself, however, still references the old figure and the 7% increase. Good blog post by the way. You know my views already on the meaninglessness of Facebook ‘likes’ alone, but the rest of the post is really well thought through. And great discussion following. Thanks – content updated. BTW I don’t agree that ‘likes’ are ‘meaningless’; rather the meaning can be difficult to understand and it shouldn’t be considered in isolation. Hi Brian. Exactly. This is why in my response I said ‘the meaninglessness of Facebook ‘likes’ alone’. The use of the word ‘alone’ is important here, and I think we’re on the same page. They are part of the measurement process, and an important part at that. However, they tell us nothing about people actually reading or viewing content on those pages, engaging with it, and, most importantly, how that content then influences them to behave. Universities building Facebook pages and conducting activities simply to drive up their number of likes are wasting time, energy and, critically, budget. My experience of working with many many universities on social media is that few have a clear understanding of SMART objectives for social media activity. I am often told that their objective is ‘to build a community’, but that in itself and of itself is of no benefit to the university (in fact, ‘building a community’ is a tactic, not an objective). It’s what that community does that is the important thing. Many universities approach social media as a technology-focused exercise rather than being led by objectives and audience. When they put the how before the why they are in serious danger of doing lovely things, but not doing anything that aligns with organisational goals and vision, and when that happens, money is wasted. And we all know how tight the purse strings are right now in universities. Yes, I think we’re in agreement. Note that I feel that metrics (on their own) can help to indicate trends, make comparisons with peers, etc. That’s a reason why I’ve published various evidence-based summaries on this blog. However I also agree that such evidence should be used in conjunction with other factors, which may included contextual information which I, as a remote observer, will be unaware of. @briankelly @lescarr It's a controlled, nurturing environment with gate, isolated from surrounding world. How is it not a 'walled garden'? Maybe it needs some elaboration but (I think!) I broadly understood what Paul meant. I think you are probably using a different (narrower?) interpretation? Re your last point, I do think there’s more to our judgements about the services we use and/or recommend to others (both as individuals and as institutions) than simply “following the crowd”. There may be ethical/social/political dimensions to the judgements we make, or we may simply see tensions between short-term gains v longer-term goals, and such elements may lead us to a different conclusion. We should try to set the patterns we want to see, rather than simply following what is presented to us – often by parties whose interests are not compatible with our own. The discussion began with ‘walled garden’ being clearly used in a pejorative sense. I agree with Paul Walk that there can be benefits in providing a managed environment. However I think the positive aspects tend not to be considered when the term is used. I do agree that there is a need to consider “ethical/social/political dimensions to the judgements we make“. It seems that Universities have chosen to make a decision that Facebook provide value as a marketing tool. If we feel that this is a mistaken decision there is a need to make a compelling argument, since Facebook usage within our sector does seem to continue to grow. We will also need to understand the issues if a case is to be made for using Diaspora as an institutional marketing tool. I certainly view Facebook as a walled garden. It clearly can be used in an open way, but privacy concerns have caused most Facebook users to restrict access to their content to their “friends” or perhaps “friends of friends”. That might suggest it is a series of overlapping walled gardens created by its users! I don’t like Facebook, and I’m only a member so that I can communicate with a few real friends (and family) who are users. I’d certainly much rather those friends and family used flickr for their photos, but if they made them private to “friends and family” I don’t think the effect would be much different. What I do think is particularly obnoxious is the way Facebook has persuaded other sites to use its “Like” button, which allows it to gather information about us even when we are not using Facebook. We rarely undertand the implications, and we don’t have to click the “Like” button for a Facebook cookie (presumably containing tracking details of our visit) to appear. If any of you have a “Like” button on your site, you are contributing to this unprincipled action. Personally I can see absolutely no reason why a University should have a Facebook page! Chris G says Facebook is good for “chatting, showing funny pictures and inviting people to parties”. Why should a University need to do that? If a ‘walled garden’ simply means that content providers have access control over who can see their content then our institutional Web sites will also be walled gardens. The term ‘walled garden’ should then be regarded as a positive one, providing richer control than can be provided by ‘open systems’. I guess criticisms should therefore be made at Twitter which provides only a very limited form of access control (totally open or open only to those who haven’t been blocked). Note that I don’t think that Chris G gave a complete list of the reasons why Universities (together with organisations such as JISC infoNet, JISC Digital Media and the JISC MediaHub are providing Facebook presences! A more useful assessment would surely be to look at what universities are using Facebook for at a grassroots level. Ultimately, course directors/administrators, alumni relations people etc, are going to use the networks that are used by their target audiences. If people start abandoning Facebook, then so will the companies using it to engage with them. I also agree that it would be useful to answr that question in the context of institutional use of Facebook, along the lines you have suggested. Note that I suspect that potential students (and their parents) will ask in greater numbers “What’s the value of a University degree?” We’ll need to be able to provide answers to such questions. The UCLOfficial Facebook page has 4,346 likes (actually today it has 4,403). In the previous survey the equivalent page (UCL/92637159209 ) had 977 likes (note this is automatically redirected to the new URL). This is equivalent to a (4,346-977)*100/977 = 344% increase in the past 9 months. Oops, yes the figures for UCL were added to the incorrect column. Have transposed and updated totals. Thanks! I think it’s we who should be thanking you Brian for taking the time to produce tables like this. Thank you! Thanks for the comment. Just to clarify the status of the evidence published in this post and in other posts – there is a Creative Commons licence for this blog. The information can be reused provided acknowledgements are given. So feel to use this data accordingly in your work in advising Universities.